So you heard the news? 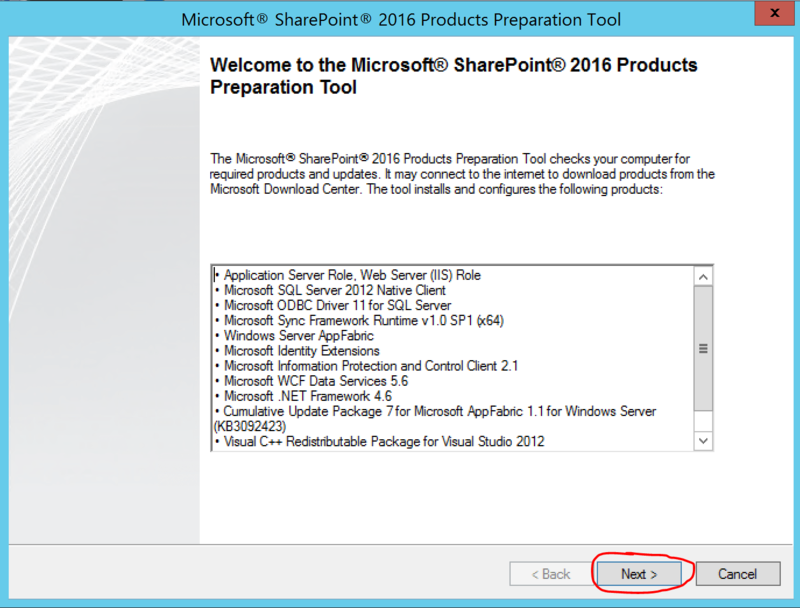 SharePoint 2016 officially hit Release Candidate (RC) yesterday, January 20th 2016. This means that we are getting really close to an RTM release. If you are like me and always want to be the first one to play with the new tools as soon as Microsoft relases them, you may be in for a little surprise. 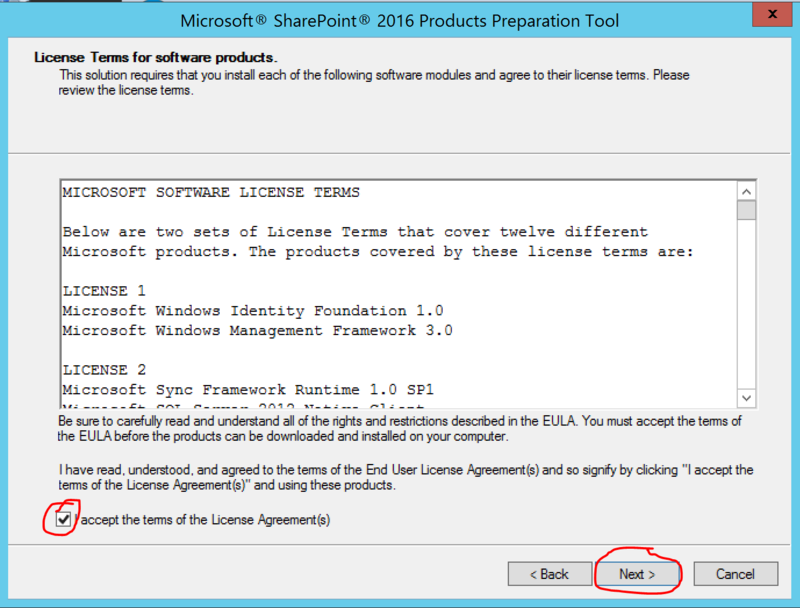 If you try to go an get the bits that were released by Microsoft yesterday from the download center (https://www.microsoft.com/en-us/download/details.aspx?id=50737) you will soon realize that this is no traditional SharePoint download. 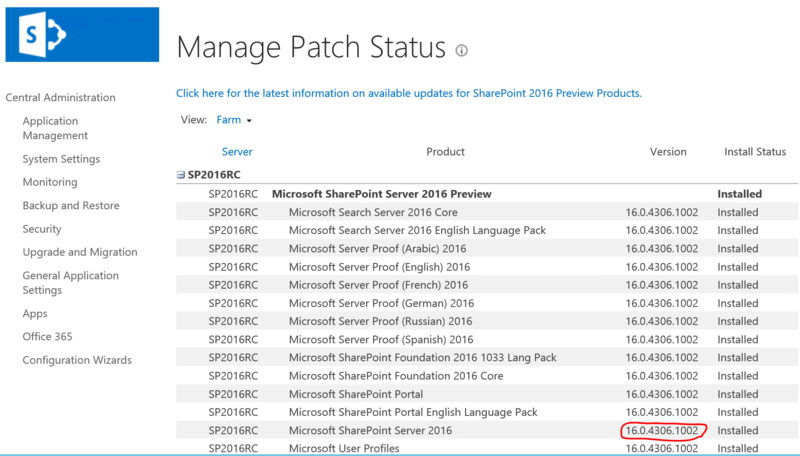 The package on Microsoft download centre is actually called SharePoint Server 2016 Release Candidate Patch and consists of at least two main downloads: one for the language you are using and the second is called a Global patch and patches the entire environment. So it’s a patch….but what is it patching? A patch has to be installed on an existing product right? Right! 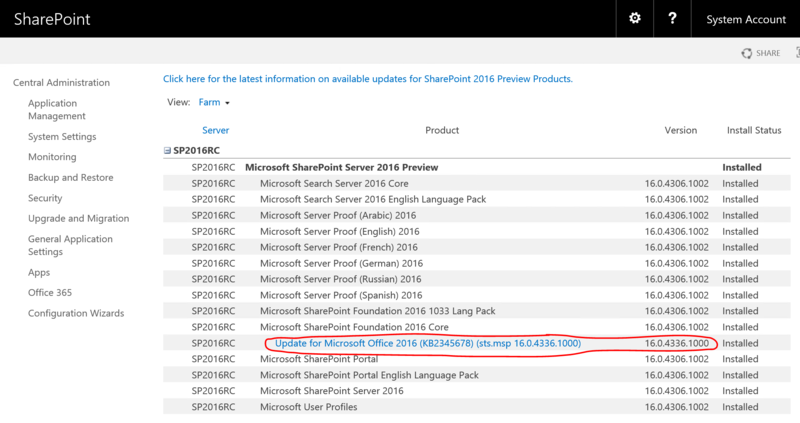 The SharePoint 2016 Release Candidate (RC) has to be installed on top of the SharePoint 2016 Beta 2 (https://www.microsoft.com/en-us/download/details.aspx?id=49961). 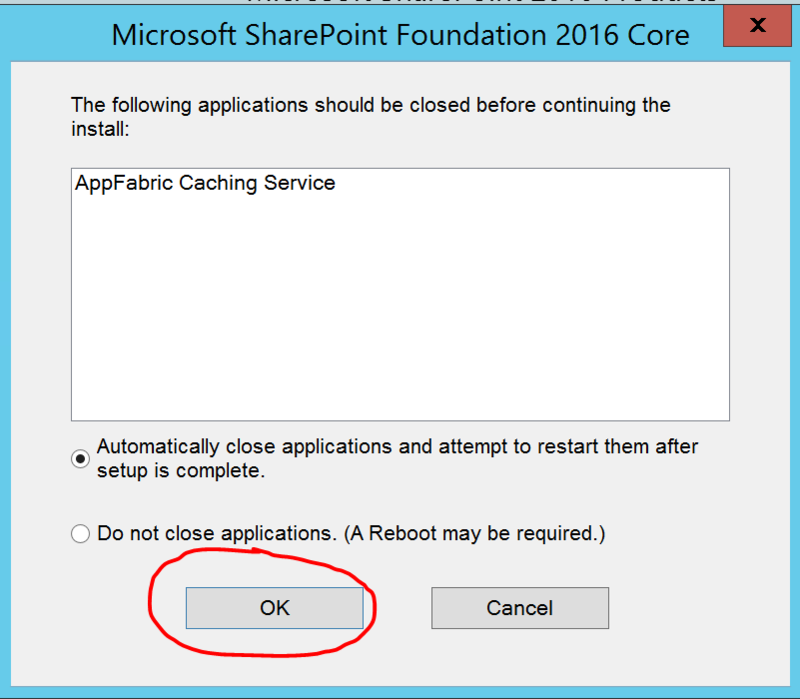 This new update process introduced in SharePoint 2016 is called the Zero Downtime Patching and allows users who have High Available SharePoint environments to patch their farms without causing any downtime. 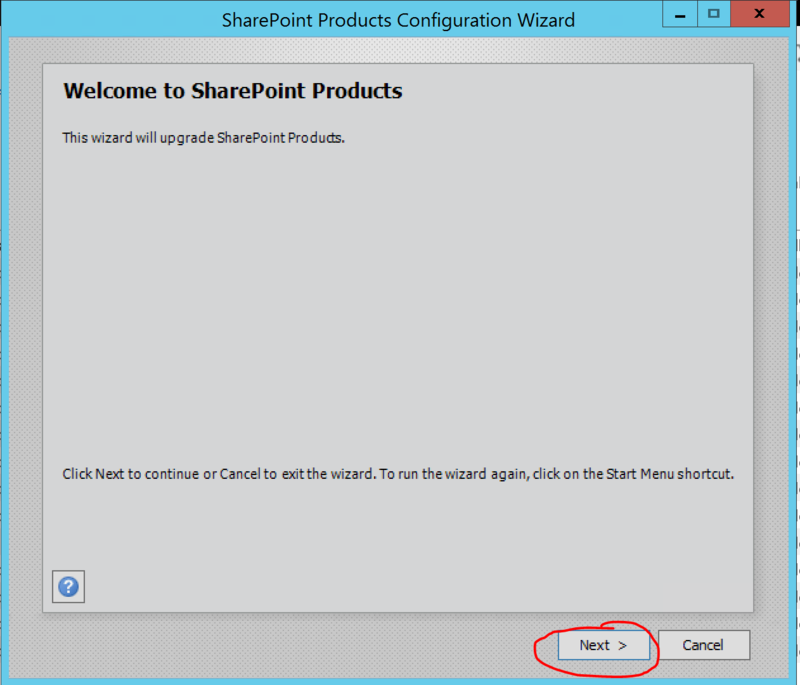 For the purpose of this article, I will guide you through the process of installing the SharePoint 2016 RC, but as always, to keep things simple, I will be patching a Single Server Farm environment. Because I am applying my patches on a Single Server Farm, I will not be able to take advantage of the Zero Downtime Patching process. I will be using the psconfiggui.exe wizard to complete the patching process which will cause downtime in my farm. Normally, what you wish to do is take off one of your load balanced server from your farm, patch it, re-introduce it back within the farm, and take the second server down for patching. 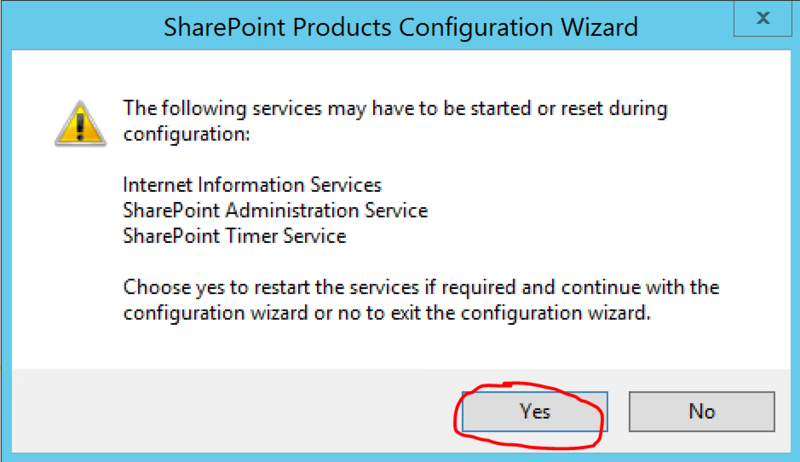 You should be able to verify that you have SharePoint Server 2016 Beta 2 installed in your environment by going Central Administration > Upgrade and Migration > Check product and patch installation status. The build version should be 16.0.4306.1002. 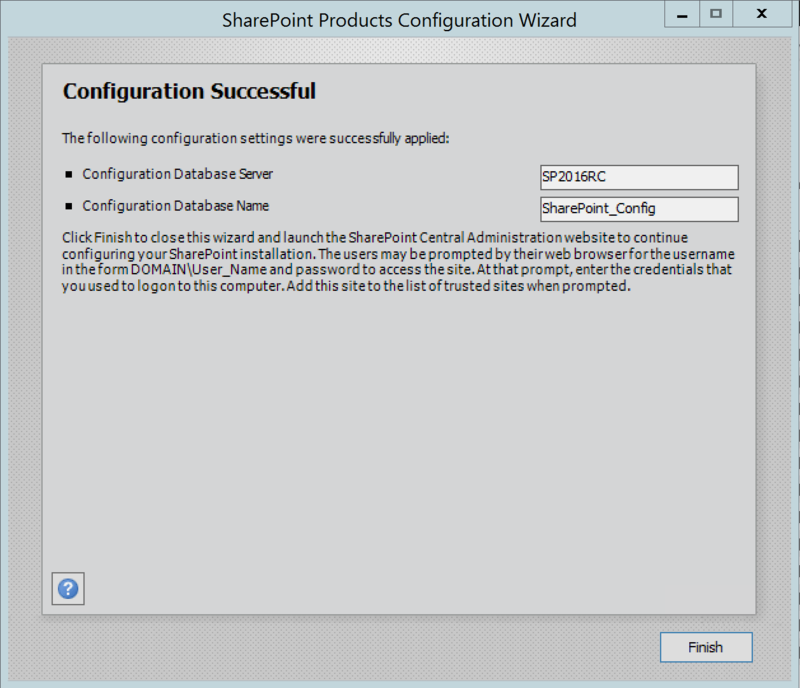 Once you have all your packages downloaded, make sure you extract both onto your SharePoint Server (in my case extracted to C:\CUs\). We will start by patching the Prerequisite Installer. 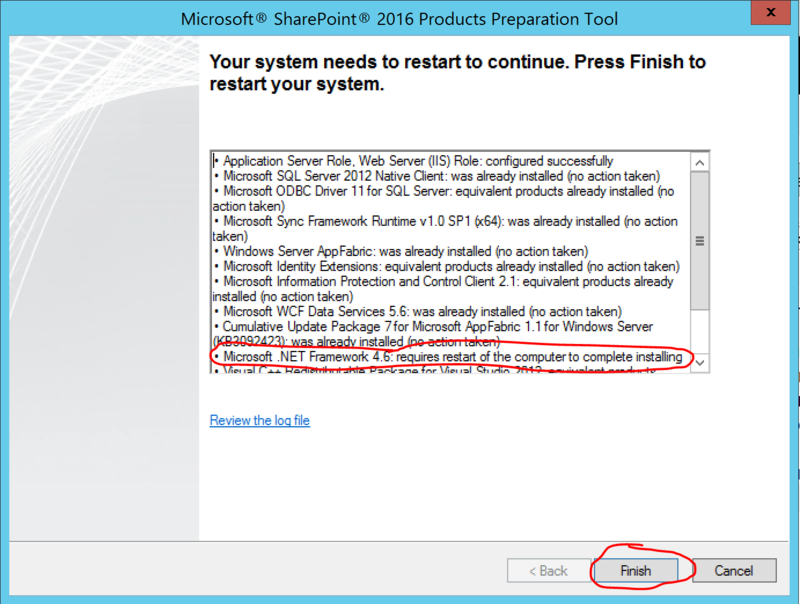 After a while, the prerequisites installer may ask you to reboot your server. In my case, it was the installation of .NET 4.6 that required it. Simply click finish and wait for the server to reboot. 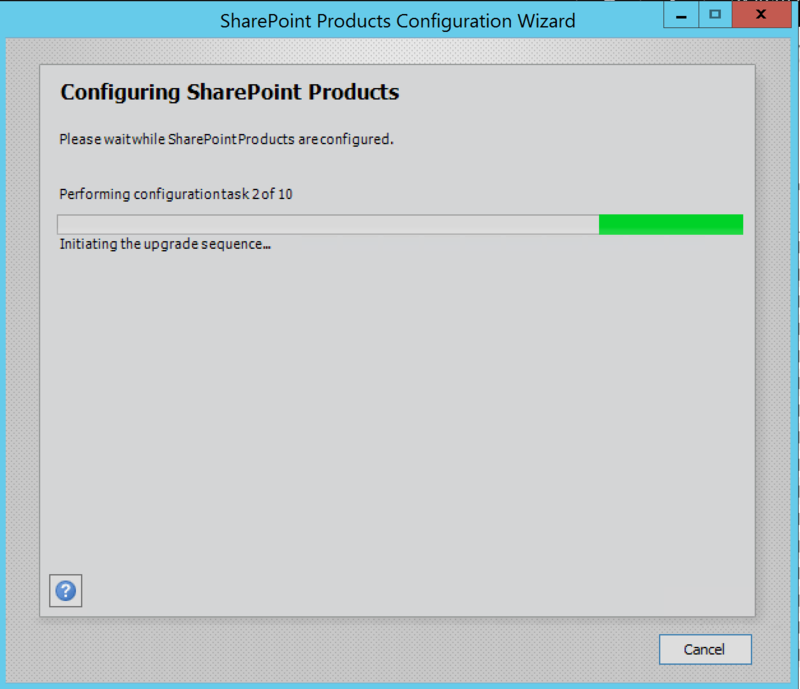 One it reboots, the prerequisites installer will start again automaticallly and finish its installation. One thing to note is that whenever the patch has finished installing, the executable (.msp) simply closes itself, you won’t get any GUI telling you that it was installed successfully. 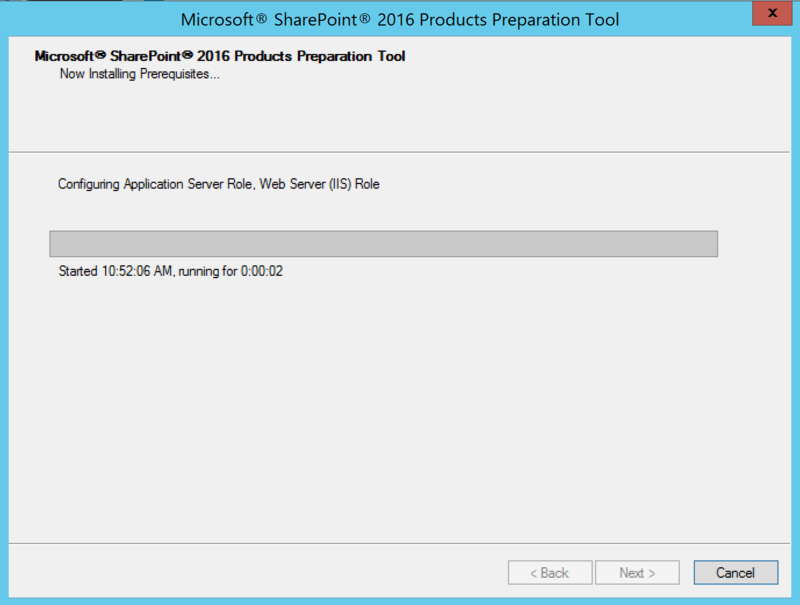 Off you go, you now have your environment running the SharePoint Server 2016 Release Candidate. It is a single server farm yes. I do have the French language pack installed (I installed the RC update for that too). 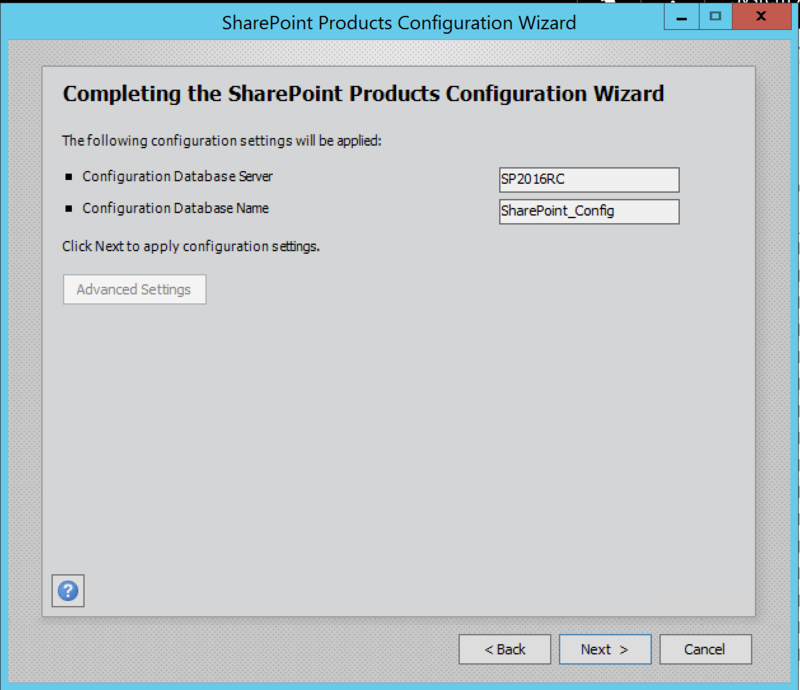 I was able to get it trough by running Upgrade-SPContentDatabase WSS_Content before the Wizard. Works. Thanks so much Julien! I add also that in prerequisites of sp2012 beta2 there is a problem with ODBC 11 driver for sql server, permalink is not correct! To fix: Launch prerequisites in unattended mode and specific the path of msi downloader.